Petrol prices could soar by 8% by the beginning of next year, it was predicted today. And the cost of filling up at the pumps could rise by 3% by this August Bank Holiday weekend. 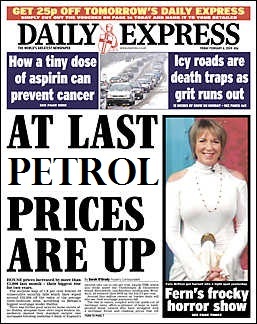 The warning to motorists came from the Retail Motor Industry Independent Petrol Retailers Association (RMI Petrol). It put the blame for the expected rises on currency movements and world oil price increases. RMI Petrol, which represents around two-thirds of Britain's 9,000 petrol forecourt sites, said petrol prices could rise as high as 125.9p per litre in the new year, smashing the current record high of 121.61p. This increase would take into account the rise in VAT and the planned hike in fuel duty. RMI Petrol chairman Brian Madderson said: "The rebound in crude oil pricing is disappointing but not entirely unexpected. It will further increase pressure on independent retailers who are fighting for survival, especially in rural areas, due to the double hit of falling volumes and tighter margins. "This crude oil increase will feed through the supply chain and could result in prices going up by as much as 4p a litre in the next three weeks." I am selling my sportsbike and buying a 250cc scooter. Touring France on scooters next summer. Yep - "if you exclude all the things that have risen in price there wasn't really any inflation and we're bang on target". Can't believe they repeatedly get away with that rubbish unchallenged by the media. Hmmm ... given the state of journalism in general and the thickness of the general public, I actually can believe that. Correction: Petrol prices have already soared. Currency movements and world prices eh? We have a budget of £600 each and have to carry our own shelter, food, clothes, stove, jerry can, spares etc. I am thinking of a Suzuki Burgman 250 or a Yamaha YP 250. You might see me strumming round Rivington on it next spring / summer. Great news for petrol owners...! Great news for those who like less people on the roads!! Count me in!